There are so many juicing health benefits that the only problem is where to start. Probably the most fundamental and commonly known fact that everybody is being made aware of today, is that we should all eat 5-7 portions of fresh fruit and vegetables a day. Now to me this doesn’t seem that many on some days then on others I may have missed the target by a mile. Juicing is one easy way to top up or ensure that you hit your daily target of fresh fruit and veg. Why do We Need all These Fruit and Vegetables? Fresh fruit and vegetables are one of the most essential aspects to a healthy diet. Following a healthy diet is one of the ways that you can ensure optimal energy levels, a balanced mood and overall feeling of good health. Nobody is saying it’s the only aspect, but it sure does help. It’s also important to follow a regular fitness programme as well as drinking lots of fluids to keep your body hydrated. Juicing is also a good way to top up your daily fluid intake. Once you make a few adaptations to your regular eating plans and introduce more fresh fruit and vegetables you’ll soon be doing it without thinking anything of it. Juicing really does provide you with a great opportunity to add a large intake of your fruit and vegetables into your diet. This can be done without any difficulty, little amount of preparation time and the ease of being able to drink it. So however busy your life style is you can fit juicing in. More to the point if you have a hectic life style juicing will give you the energy levels to allow your body keep up with the pace. Without going into too much of the science I have listed below some of the most common fruit and vegetables for juicing and some of their nutritional health benefits. It’s a great place to start if you’re interested in juicing health benefits. Juiced carrots often form the base of many juice recipes. This is great because they are easily available all the year round and inexpensive to buy. Carrots are rich in beta-carotene, which is good for the immune system as well as the skin. 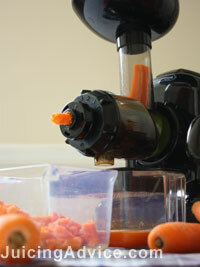 In the photo here you can see how my juicer is easily making carrot juice. With such a wide variety of apples available to us the flavour can range enormously. I would recommend experimenting with different varieties to explore the different flavours. Apples contain malic acid, which aids digestion. They are also high in pectin, a soluble fibre that may help to aid constipation or dihreoa. Some varieties of apple are also rich in vitamin C, which is good for boosting the immune system and helps combat common illness such as colds and flu. One of the most common forms of fruit juice orange juice is rich in vitamin C, and often used to combat a cold. Oranges also contain folic acid, which is good for cardiovascular health. 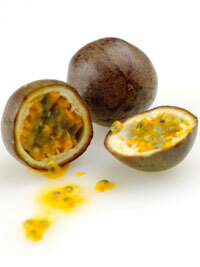 These funny looking fruits have been recently recognised as a super foods. They contain antioxidant powers, which help to boost the immune system. They are also good in helping to relieve urinary tract infections. Beetroot like carrots is rich in beta-carotene, which helps to boost the immune system. It is also rich in iron and manganese. Beetroot juice can be a really strong flavour so use only in small amounts. This bulb vegetable is excellent for supporting the gall bladder and liver. It also has a diuretic action and is often used to calm the nervous system. I hope this helps you get started on finding out about juicing health benefits and how they can improve your health and general well being.